Doğukan Ulaç ranked 1st in the 30. Bosphorus Intercontinental Swimming Race in men’s class. 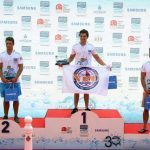 Near East University long-distance swimmer Dogukan Ulaç completed the 6.5 km parade first in the Bosphorus Intercontinental Swimming Race, which is also considered the “World’s Best Open Water Swimming Organization”, in 46 minutes 58 seconds in the General Class. Near East University Press and Public Relations Directorate released a press statement stating that Doğukan Ulaç became the 1st of the 30th Bosphorus Intercontinental Swimming Race organized by Turkey’s National Olympic Committee from Europe to Asia on a 6.5 kilometer route, where 2400 swimmers from 52 countries participated. Doğukan Ulaç completed the route in 46 minutes 58 seconds and ranked 1st in the Men’s General Class. Starting from the Anatolian side Kanlıca pier, the race ended on the European side Kuruçeşme, and the ranking process were determined by the chips connected to the athletes’ feet. 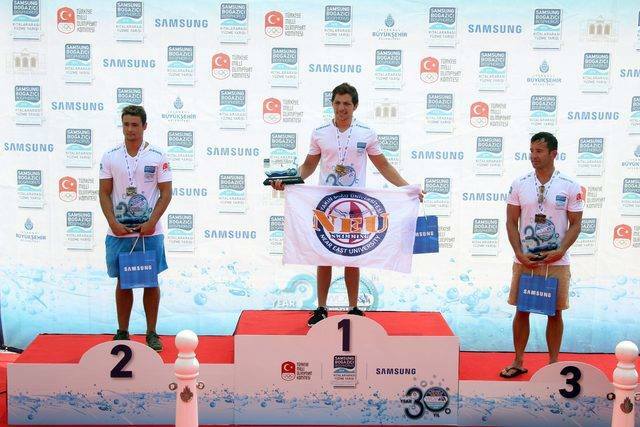 Triumphant swimmer Doğukan Ulaç, who have completed the Intercontinental Bosphorus Swimming Race with the 2nd degree in general class with 52 minutes 21 seconds, also become the first in the 18-24 age category last year. Doğukan Ulaç who got the first place in the general class of men said that he dedicated his championship to his coach Mehmet Gürcenk and his family. Near East University Head of Department of Health, Culture and Sports, Assoc. Prof. Dr. Hakan Atamtürk stating that this success was not a coincidence, also thanked those who supported this achievement. One of the most challenging aspects of swimming sport is the marathon races, said Assoc. Prof. Dr. Atamtürk, and that the most challenging of the marathon races is the “Bosphorus Intercontinental Swimming Race”. Near East University has achieved an important result in marathon branch depending on its experience, said Assoc. Prof. Dr. Atamtürk and added “Mr. Caner Aspava, who made our swimmers like marathon races, became the first Turkish Cypriot who passed through the English Channel, Osman Akkuş who participated in this race 26 times with Mustafa Yeşilada, and Mehmet Gürcenk who is the coach of Doğukan Ulaç are remarkable swimmers of our country. I congratulate these champions for training swimmers. We are proud to demonstrate once again that Doğukan’s success is not a coincidence”.